Augmented reality (AR) and virtual reality (VR) crazes didn’t die out with Pokémon GO. This dynamic-duo is alive, well, and benefiting businesses. AR and VR technologies are living up to and surpassing expectations in terms of creating riveting user experiences. Using this technology has a unique way of increasing brand engagement, and generating new ways to interact with services and products. If your company hasn’t yet experimented with AR or VR technologies, explore the following innovations. The answer to improving your numbers this year may be to implement AR/VR into your business today. Why mail out hundreds of sample products when your customers can test them on your website using AR and VR technologies for a fraction of the cost? Retail (e.g., trying out makeup products, clothing, shoes, new furniture, etc.). Realty (e.g., showing potential buyers around a property without leaving the office). Construction (e.g., letting customers see home improvement renovations before breaking ground). Video gaming (e.g., introducing products to new audiences). Tourism (e.g., providing virtual traveling experiences that save money). Hospitality (e.g., showing guests the inside of a hotel before booking). Software proof of concept examples. Hiring local, global and freelancers. Education (e.g., almost any education can be adaptive to AR/VR). The possibilities for AR/VR technology for free trials and product testing are endless. Creating a virtual trial experience can save a company time and money, as well as increase the odds of a customer completing a sale. Rather than answering customer questions about a product with simple words, use augmented or virtual reality to show the customer what the item, service, or experience would be like for them personally. Customers can develop stronger bonds with the product or service in the virtual environment, increasing the odds of making a purchase. Go ahead and be the company that goes above and beyond in an age that emphasizes engaging, immersive user experiences (UX). Implement AR or VR technologies into your company or website to give unforgettable UX users will talk about with their friends and family. Something as simple as giving a virtual tour of your establishment in 3D can be enough to increase clicks and decrease bounce rates. Generate a buzz and get people talking about your brand with exciting immersive UX. If you partner with the right developer for your website’s AR or VR elements, you could create personalized UX based on the user’s previous shopping habits. For example, your e-commerce store could offer an augmented reality changing room experience, recommending different clothing items the user can “try on” virtually, based on previous purchases. You can take related products and suggestions to the next level with AR and VR technologies. The emphasis on personalization has grown in business as brands discover the benefits of tailoring the user experience to achieve greater engagement. Yet personalization isn’t only valuable in the consumer sector — it’s also making waves in-house. Personalizing the employee experience can garner amazing results, especially when it comes to worker hiring, training, and retention. AR and VR offer exciting new ways to provide personalized learning experiences to your employees, potentially boosting productivity and cutting HR costs. AR and VR make it possible for companies to develop personalized training programs that can enhance learner engagement. Employees can have more fun while they learn and get a “feel” for the concepts they will be implementing in the job. Putting the worker in a virtual environment can generate immediate engagement, increasing the odds of employees remembering and implementing what they learned later. AR/VR in the workplace isn’t just an idea – Walmart, Verizon, and JetBlue are already using STRIVR tech to change the way they train employees. STRIVR uses simulators to put employees in realistic environments, where they can test their abilities to handle work-related situations. Employers can then grade their efforts and make changes or suggestions to apply to similar real-life situations in the future. If your company could benefit from better employee training or retention, consider an immersive AR or VR program to do the trick. Millennials (those born between 1980 and 2000) are the largest generation in American history. They are the most important consumer type to most businesses, with an estimated spending power of around $10 trillion over their lifetimes. Millennials are also unique in terms of what they respond to when it comes to branding and advertisements. They are the first “digitally native” generation and keen on companies that keep this in mind. One of the fastest ways to get to the hearts of millennial shoppers is by offering a modern e-commerce experience. Millennials love technology, and they value experiences and excitement. Combine all three of these wish-list items by immersing visitors in an AR or VR shopping experience. Attract and impress a younger audience by implementing AR and VR user experiences on your website. Just make sure your technology works and doesn’t have any kinks; millennials are quick to bounce if the tech doesn’t function the way it should. Have a place on your site for your millennials to “do a quick fix” for you — and they will — for free. A millennial is more likely to help you than any other sector of the population. Ask — provide a way — they’ll help you. Millennials also appreciate authenticity. Don’t do your company the disservice of implementing just any off-the-shelf AR/VR experience. Make it unique to your brand. Customize your own alternate-reality feature to make it brand-specific. An example (especially for the millennial): Support a cause such as environmental sustainability, then show customers the rainforest you’re saving or the recycled-material apparel you create through enchanting AR and VR experiences. Let your authenticity and uniqueness shine in your AR or VR tech. Your augmented- or virtual-reality technology doesn’t have to be especially complex or sophisticated. Something as simple as building your own AR/VR app can be enough to set your brand apart from competitors. Gaining a competitive edge is all about doing something other brands aren’t doing. 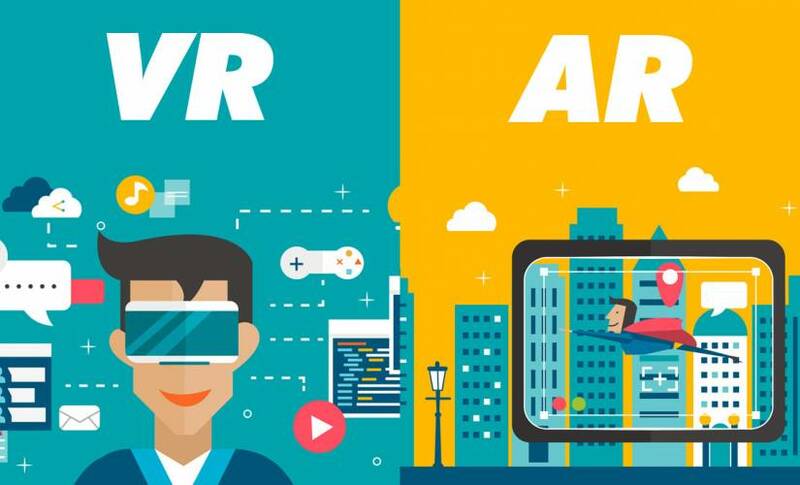 AR and VR are still relatively new enough that the chances are high your competitors have yet to fully take advantage of these technologies. Beat them to the punch by adopting AR/VR sooner rather than later. Get creative with your AR or VR technologies. Have your team — or an outsourced provider — create a fun and immersive game for your customers to play. Request that customers submit their email addresses to access the game, helping you build your contact list for campaigns. This is a simple example of how you can use AR and VR at your company to stand out from competitors and as a marketing tool. The creative possibilities are endless when you start brainstorming ways to have fun with AR and VR. AR and VR provide excellent opportunities not only to increase company profitability but to genuinely improve the user experience. It’s a win-win technology for everyone involved. Your company can provide engaging UX, bring people together, improve employee training, and increase customer happiness with immersive technology — all while boosting your brand’s reputation and recognition in your niche. Creative brands are utilizing AR and VR to provide more engaging user experiences, let customers try out new products, expand employee training programs, and much more. You, too, can use AR and VR technologies in affordable and realistic ways and enjoy a measurable change on your bottom line. Explore all the ways augmented and virtual reality technologies may be able to boost your business.